In my previous blog, I explained (with the help of a delicious lasagne analogy) how a custom built website will outperform a generic pre-built template any day of the week. A massive factor in this comparison was page speed, specifically that a custom-built website written with high quality code (like these ones) will load much faster than a bloated off-the-shelf alternative. So why is page speed important? In short, it’s crucial for ranking well on search engines, providing your users with a good experience and ensuring your website achieves it’s goals. As well as people, your website will also be visited by robots such as search engine spiders or screen readers. 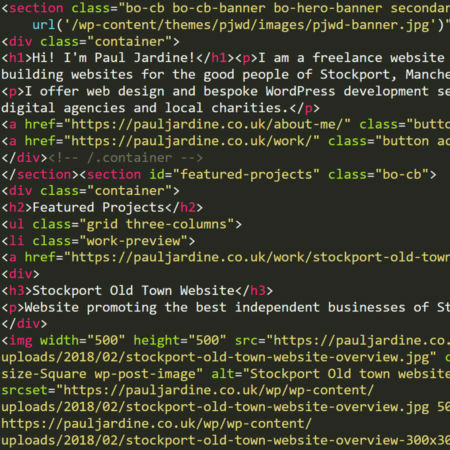 Robots don’t see what your website looks like, they do however read the source code of your website (right click and select View page source if you ever fancy a look at this). Code that is well written, structured and optimised will be easier for a robot to read. Furthermore, a web page that is made up of 20 files will be quicker for a computer to read than one with 100 files. A website built with optimisation in mind will be more successful on search engines, especially if you also have some well written content. Whilst appeasing our robot overlords is all well and good, how does page speed affect the actual people who visit your website? According to Forbes, the average humans attention span is around 8 seconds. With your average internet user being bombarded with information from all directions, many people expect to get what they want from your website almost instantly or they will go elsewhere. A website should be designed and built to allow it’s users to complete their tasks as quickly as possible. If your website is chugging away loading for most of your golden 8 second window, your visitors will simply leave and take their custom elsewhere, no matter how engaging your content is or how much effort you put into your social media campaign to get people here in the first place. Equally, a web page that keeps jumping all over the place because images (or adverts) keep loading in whilst you scroll down the page is massively frustrating for even the most determined website visitor and will most likely result in them leaving your website. Effectively, a slow loading website will produce a bad experience with your website and a bad experience with your brand. How fast is my website? Clearly, having a fast website is imperative to it’s success. 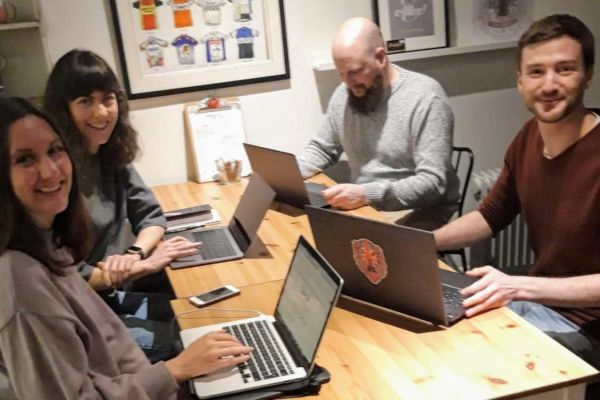 As mobile device use continues to grow, (as of November 2018, mobile browsers make up almost half of all internet use in the UK), it’s important that your website loads quickly on mobile networks as well as on wifi. Page speed is influenced by several factors, ranging from the number of files used on a page, the size of those files as well as the quality of your hosting package. I’ve written about some of those in more detail in the Website Optimisation section of my blog. There are various free tools available to rate your website’s page speed including Google Pagespeed Insights and GT Metrix which both provide a detailed breakdown of how you can make your website faster. 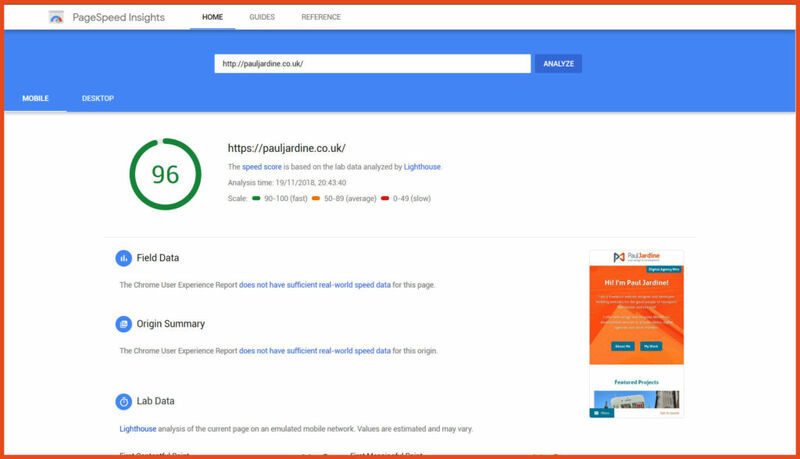 I’m very proud to say PauJardine.co.uk scores 96% for mobile and 100% for desktop on Google Pagespeed! If you would like to chat to me about making your website faster please feel free to get in touch! Bring your basket and join me on a hunt as we look at my five favourite website Easter eggs.